Don't have tons of things to say about either place, and since we ended up hitting them on the same day, I figured they'd make for one post. We've been meaning to take in more local pizza. And we found a great place. 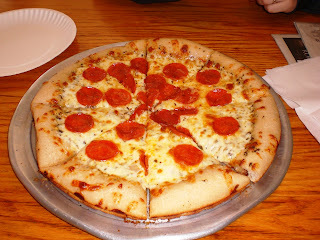 After we went sledding in Lambertville, we came back along the river and ate at Yardley Pizza. Family-owned and operated, in downtown Yardley, and they take cash or check only. They also make a great pizza. We ordered a medium pan pizza to share, with white sauce (olive oil and garlic instead of the traditional marinara) and pepperoni. Great flavor all around. Plus, leftovers! I can't wait to try more! We went to see a high school production of Anything Goes with some friends, and afterward we stopped by The Great American Diner & Pub. I had the tiramisu, Jonathan went with a country-fried steak breakfast, and our friends had a pancake breakfast and the carrot cake, respectively. I thought the tiramisu was really good, although I would have been happier if it was $1 less. Emily reported that the carrot cake was good, but the icing was disappointing. Jonathan thought the steak was good, the gravy was different and kind of sweet, the potatoes were thick (much like the kind I had at the Maurice River Diner) and I didn't ask about the eggs. It was our first time there, although Bryan and Emily had been there a few times before. It's an interesting place. There were way more cars in the parking lot than people in the place, but it was still busy for a Friday night. The bar area kept most people occupied though, and the service was pretty prompt. I don't know if we'll go back, but we have been meaning to try out more diners, so it's entirely possible.